ROCHESTER, NY (WXXI) – In the ongoing debate over a proposed waste to energy facility at the Seneca Army Depot, a group of residents and business owners who are opposed to the project traveled to Albany Tuesday to call on Governor Andrew Cuomo to reject it. The facility, proposed by Rochester-based Circular enerG, would produce electricity by burning up to 2,600 tons of trash each day. A number of residents, neighboring towns, and elected officials have come out against the project. Irelan and her husband moved from California to the Finger Lakes ten years ago to join the growing wine and craft beverage industry. She said they are striving to be carbon neutral by using geothermal heating and cooling and recycling all of the winery’s waste. Despite the opposition, Circular enerG is reportedly pursuing the waste to energy project under a New York State Public Service Commission power plant siting law, which they say does not require a special use permit from the town of Romulus. Attorney Alan Knauf, who is representing the company, has said the facility would meet all the strictest environmental standards and it would benefit the local economy. 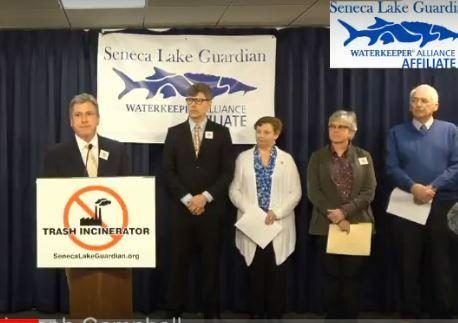 Joseph Campbell, president of the nonprofit organization Seneca Lake Guardian, said at today’s Albany news conference that he hopes Governor Cuomo makes a strong public statement against the Circular enerG proposal. Campbell contends that because the town of Romulus Planning Board prohibits this type of incinerator, home rule should prevail over state law.